FIBA World No. 8 Turkey beat our very own Gilas Pilipinas last night held at the Mall of Asia Arena during their tune-up game with a score of 84-76. It is one of the preparations of our national team for the incoming Olympic Qualifying Tournament. It is a huge improvement for Gilas Pilipinas as they were defeated by Turkey with a huge disparity in a score of 103-68. Andray Blatche led Gilas with his 20 points, 7 rebounds and 5 assists. Terrence Romeo helped him with his 16 points who started the attempt to cut the lead of Turkey in the 4th quarter with his 8 consecutive points but just fell short. Jayson Castro and Gabe Norwood also contributed with their 13 and 10 points respectively. On the side of the Turkish team, point guard Ali Muhammed led them who scored 13 points while Cedi Osman had 10 points. Blatche outscored his defenders in the 1st quarter where he got 10 points but the Turkish team recovered and countered it with 11 points. During the 2nd quarter, there was a short power outage at the 6:37 mark of the game but it was resumed after 5 minutes. After the 1st half, Turkey got a 7 point lead in a score of 40-33. At the opening of the second half, Turkey took the advantage of the Gilas’ consecutive turnovers and got a commanding lead of 17 points. 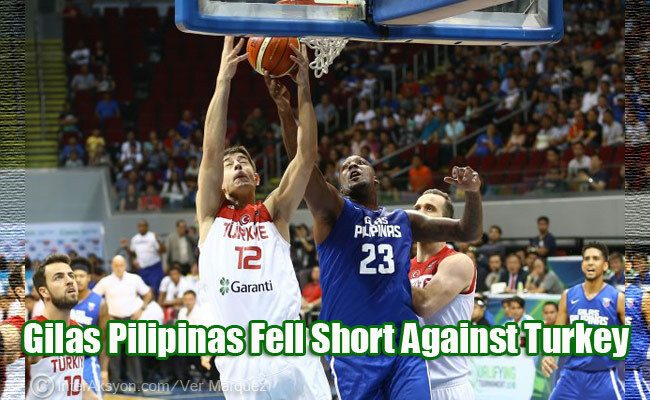 Blatche scored at 6:26 mark to break the silence for the Filipinos. Gilas got energized where Romeo scored 5 succeeding points and our team had a 20-8 run. In the 4th quarter, things got heated between Marc Pingris and Omer Asik and both players got technical fouls but Asik was fouled out at the game when he receive his 5th and last foul. Norwood scored 5 straight points to cut the lead in just 7 points, 72-65 but Turkey countered it with a 5 -0 run. With 47 seconds lefts in the game, Romeo scored 8 consecutive points but it was still not enough. Gilas Pilipinas will be back at the court this coming July 5 for the start of Olympic qualifiers against France led by Spurs’ Guard Tony Parker.